Wat Sungai Siput featuring in Nam Kwak (female godness of wealth) and it has been the benmarking of Archan Tia for many years where you get to see stuff like Nam Kwak possession that you can find nowhere else except here in Wat Sungai Siput. Due to the economic crisis in these years, many had hard times living their life, some losing their job, some can’t get a job, market is slow and business is bad, Archan Tia says it is time to give all that he had learned in the discipline of wealth and fortune, together with the will of Nam Kwak herself, to bless the people who need it. 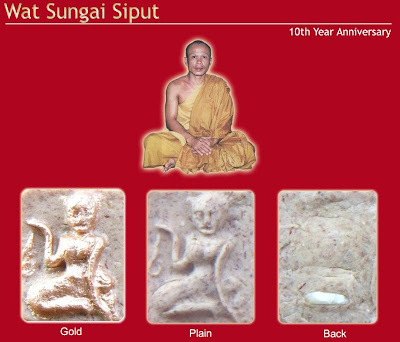 In conjunction with this, for the coming event of “Papha” (31/08/2010), Wat Sungai Siput will release the Nam Kwak amulet edition 2010 for people to rent. The amulet's ingredient are 108 rare herbs plus “king wood” powder and it will be handcrafted piece by piece by Archan Tia himself and its definitely not from factory, Archan Tia says he likes to made the amulet by himself instead of mass production from factory so that each amulet is unique. Despite its outlook, Archan Tia says it will be absolutely powerful because he will spend 1 month to meditate and chant the amulets. Your contribution help the building of Ubosot! Sadhu! Sadhu! Sadhu! Beside of this he is also interest in meditation and would kindly invite those who are interest to come and learn together. what I can describe about archan tia amulet is just "wear it and feel it"
how n where to get the amulets or the tarkuts.thanks. ok will you be ordering too why not i join you just to save some cost for the temple.do let me know if i can join in , thanks. Haha bro, I'm from Penang le. o....... i see that i cant join you liao. ok i will try to see how to order . love to have Lp tiger skin takurt too..thanks. All times are GMT +8. The time now is 04:43.